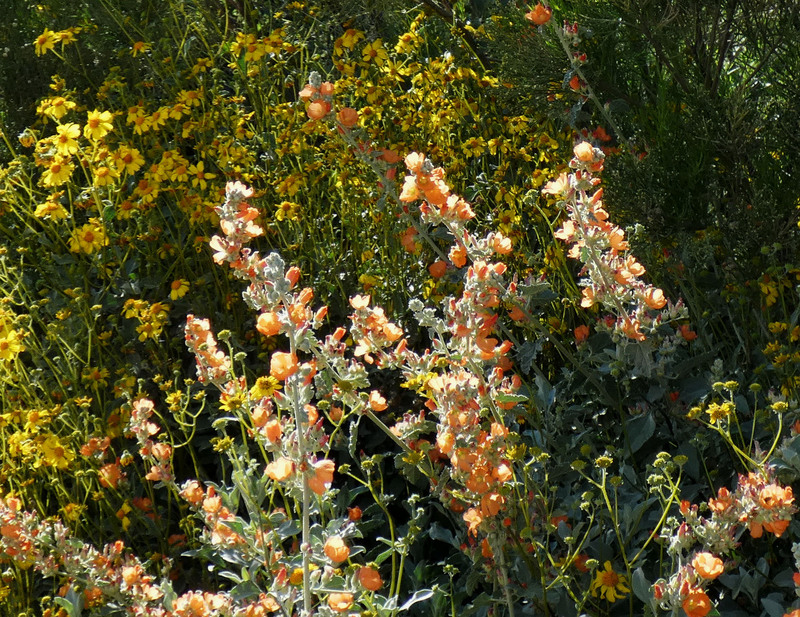 The orange flower is Desert Globemallow, Sphaeralcea ambigua. I am not sure of the name of the yellow flower. Flowers on the Apache Trail, Arizona. 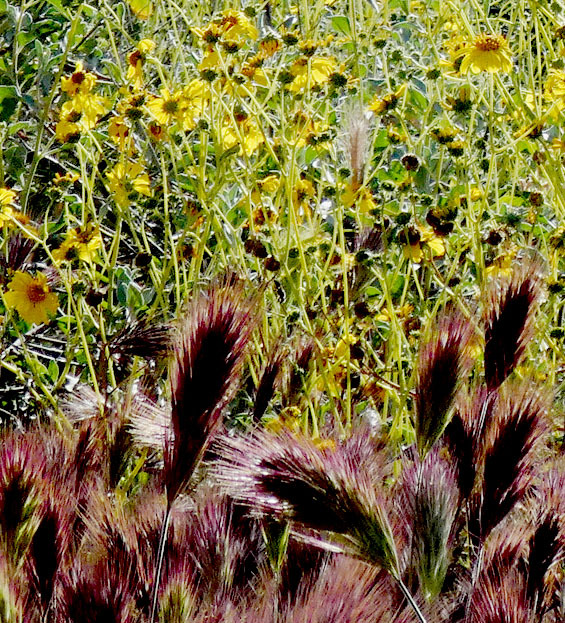 Roadside flowers and grass near Apache Lake, Arizona. 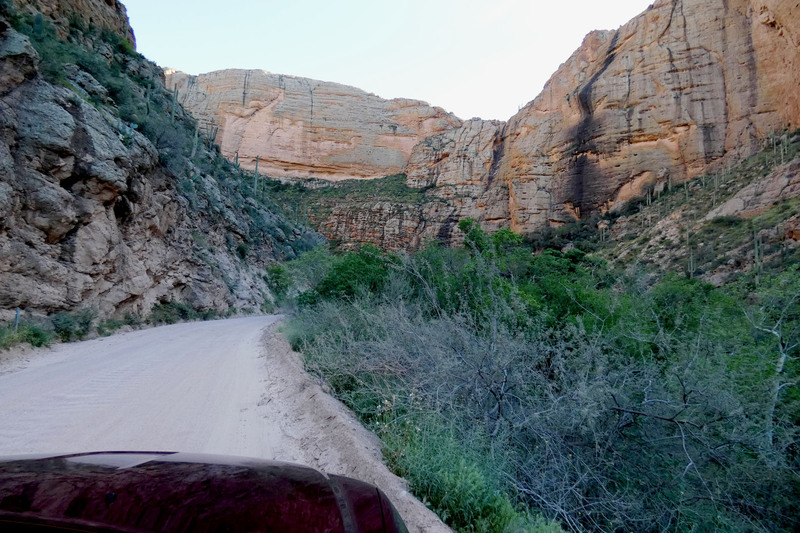 Last week my husband and I got to drive the Apache Trail, near Phoenix, Arizona. We were told it had snowed just a week before, and the desert flowers were in full bloom. 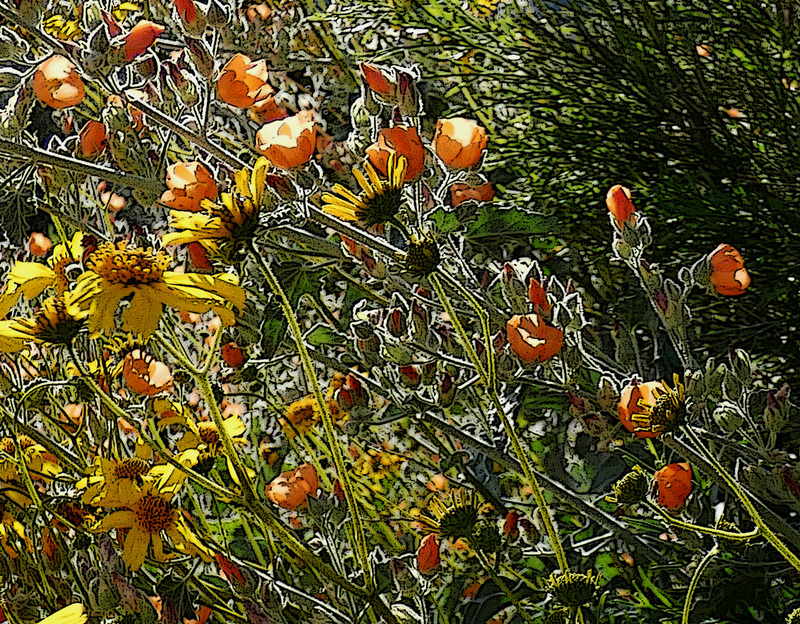 For flatlanders like us, it was a visual treat to see the sun shining through the plants above us on the slopes. The blend of forms and tints flowed and swirled and varied every few miles, and the ephemeral beauty made me remember this passage. “It is all here, yet I can’t see it.” “Fast enough,” I would add. There is so much more to learn about those plants and their environment that I will never be able to grasp. 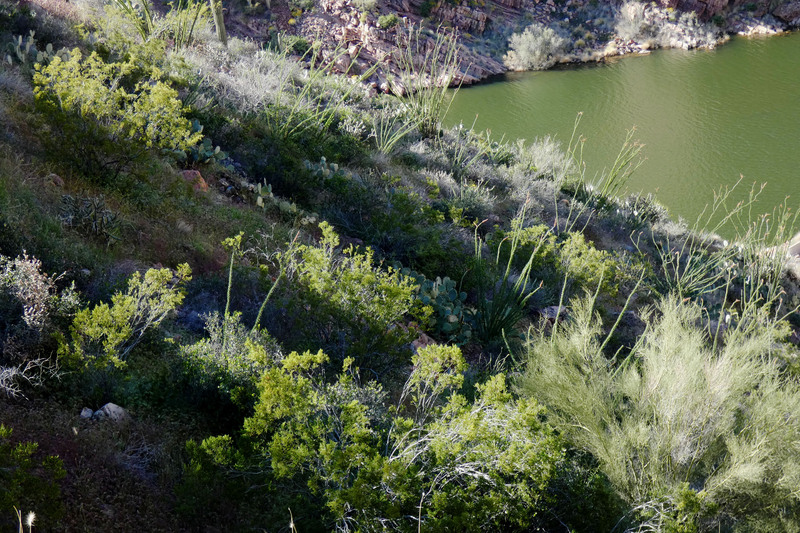 Green and silver desert plants. 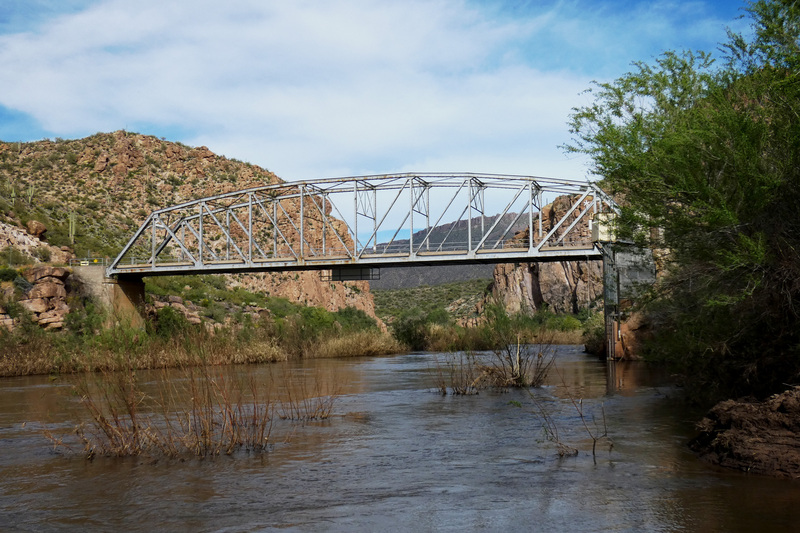 Bridge across the Salt River. On Highway 88, the Apache Trail, Arizona. 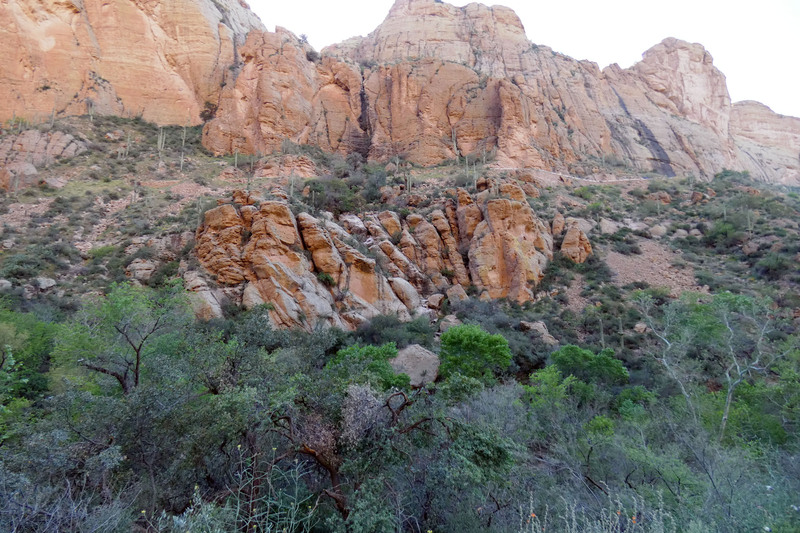 Rocks along the Apache Trail. Beverley Nichols was a British author who wrote over 60 books and plays. In the 1930s, he wrote a series of books that told how he restored some houses and gardens. His tone is gently humorous, but his joy at the wonders of changing seasons and growing things comes through. I find those books restful and soothing, and I have read them several times. Excerpts from three of the books were republished in 1971, in a collection called The Gift of a Garden, or Some Flowers Remembered. In the foreword, Nichols says that the character of the Professor “was based on an eccentric genius called Professor A. M. Low, who was much in the public eye before the war.” There is a lot about Archibald Montgomery Low on the internet, and his interests and writing were wide-ranging, although he was not actually a professor. This speech may be completely fictional, but its sentiments express my thoughts at seeing these beautiful desert flowers. What a great experience. I was especially interested in the globe mallow; just a week or two ago, I found another species growing wild in the Rockport City Cemetery. I’ve not identified it further, but your photos here are a lovely complement to it. I will keep an eye out for that next time I am in Rockport! I don’t think I have ever seen this flower before, but I really loved the bright orange flower with the silver gray foliage. Beautiful photos and what a wonderful place to visit. I grow that mallow here in Austin, but it is native to very far west Texas and Arizona, and New Mexico too, I seem to recall. It’s a much more appropriate plant for that area. 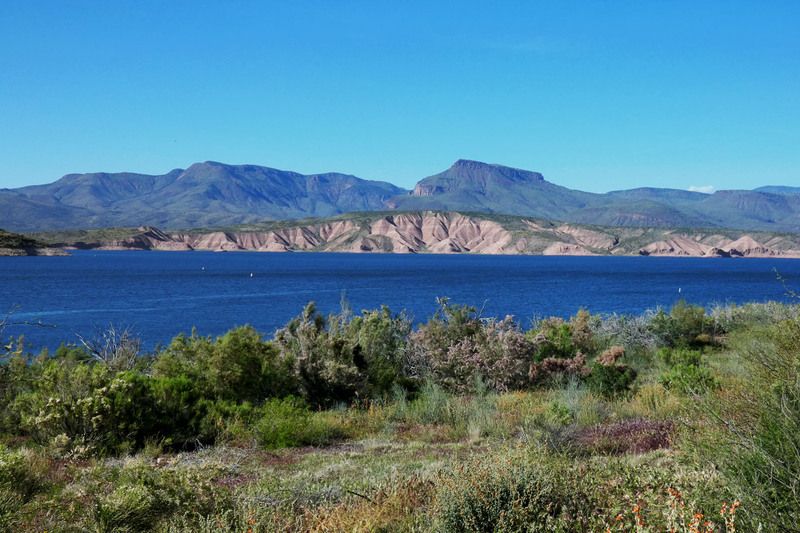 Love the Apache Trail shots! How wonderful, to have been able to see this–the scenery is amazing on its own but the addition of the bloom–wow! I LOVE orange flowers! I love Beverley Nichols’ books! And I’ve never known anyone else who ever heard of him!